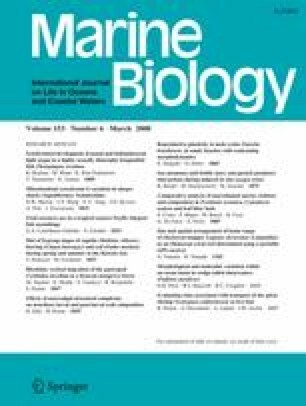 Coral reef fish generally have relatively sedentary juvenile and adult phases and a presumed highly dispersive pelagic larval phase, yet previous studies that have tried to relate pelagic larval duration (PLD) to population structure have given inconsistent results. In the present study, the population structures of two damselfishes, Stegastes fasciolatus and Dascyllus albisella, were examined using mitochondrial control region sequences. The two species have similar PLDs (∼25 and 27 days respectively), but consistently differ in their settlement preferences, habitat, and densities in populations throughout the Hawaiian Archipelago, from Hawaii north to Kure Atoll, and south to Johnston Atoll. Information on habitat preferences and population densities were collected between September 2000 and October 2002, and tissue samples for the genetic studies were collected between January and April 2004. Based on the differences in habitat and abundance of the two species, the expectation was that S. fasciolatus would have high genetic variability but little population structure compared to D. albisella, and this was largely confirmed. Stegastes fasciolatus had little population structure in most of the Hawaiian Islands, and D. albisella showed evidence of strong population structure throughout its range. An exception to this pattern was the large difference between the Kure Atoll population of S. fasciolatus and all others. These results suggest that the interaction of several biological factors (e.g. species-specific spawning habitat and season) with environmental factors (e.g. seasonal wind and current patterns) may have more influence on population structure than single life history characteristics, such as the PLD. We would like to thank K. Asoh and Editor J. Grassle for helpful comments and B. Bowen for providing additional NWHI specimens. This research was funded by the Hawaii Division of Aquatic Resources, Department of Land and Natural Resources and the David and Lucille Packard Foundation PISCO program and the NOAA Fisheries Office of Habitat Conservation.